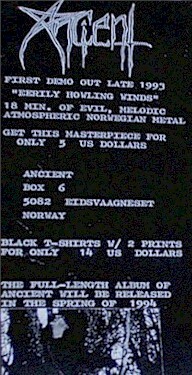 Black Metal outfit ANCIENT was initially formed in Eidsvaagneset / Bergen as a solo project by Aphazel. 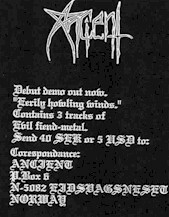 ANCIENT's first official three track demo was recorded in 1993 at Verftet Lydstudio. The tape sold over 700 copies and gained the band a deal with Listenable Records in France. Red card stock printed cover with a white tape.